As a priest, I do on occasion get to go shopping for church. Usually it’s not that exciting. The coffee for Sunday didn’t get bought or we can’t find any of the 793 bottles of glue we have for children’s art projects, so while you’re out, can you pick up some more? Other times I shop for things liturgical. Candles, sand, stones, fabric - it’s amazing what some creativity and tasteful drapes of fabric can do for a room to create prayerful space. 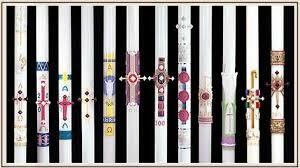 And then, during Lent, I get to shop for the Paschal Candle. With enough time in case it’s delivered broken to get another one - learn from my mistake, newbies. In the Episcopal Church, as in other denominations, we light the new Paschal Candle at the Easter Vigil. It burns for the Great Fifty Days of Easter, at baptisms, at funerals, and at other holy days as prescribed. In the beginning of all things church, it was likely a really large candle made by the local artisans. But then Constantine won the Battle of the Milvian Bridge and Christianity got its status changed from outside agitator to insider established religion. So what once was a really large candle made by the hands of the faithful, probably from bits of pieces of the candles they had from their homes and lives offered to be melted and melded into something new and holy, is now a full on cottage industry. The internet rabbit hole that is Paschal Candle shopping is mind numbing. There are plain options, with no decor, ready for the priest to carve the cross and the date at the Vigil. There are hand painted candles of all types. There are do-it yourself candles for the truly courageous. There are theme candles with matching altar frontals. There are candles with Jesus doing aerobics…or praying…I’m not entirely sure. There are wax candles wax that will burn down through the year. There are fake candles to be filled with liquid wax from year to year (not my personal preference).The prices are as diverse. And then there are the sizes. Some Paschal Candles are smaller, and some are large enough to demand a four or five people to carry it into the church and a small crane to hoist it in place. But at the end of the day, it is still a candle, a holy fire lit from the new flame. The Paschal Candle will be lit from the new fire and lead us by its light into new life. It will witness many baptisms as we welcome new members into the life of Christ. I will light it as a tangible reminder of eternal life when we gather for funerals. Every year, when I unbox the shiny new candle and admire it, so perfect, so…new, and hope I don’t break it before Easter, I wonder who will be present with us as we light it on Easter who will be part of the greater light on a distant shore next year. I wonder which new lives will add to its light and how they will change our community. I wonder how we will all be shaped and changed in the witness of the Light of Christ. Which bits and pieces from our lives, from our homes, from our selves and souls, will be melted and melded into something new and holy, perhaps not entirely joyful, but still, something of the Light of Christ as we begin this part of our resurrected life?